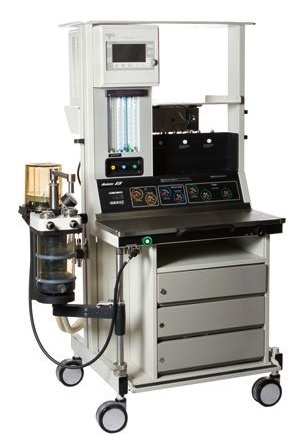 Modulus SE anesthesia machine supplies set flows of medical gases to the breathing system. A large selection of gases, vaporizes, ventilators and monitors gives you control of your system’s configuration. Comes with O2 (two connections), N2O and air, plus one more cylinder connection for N2O or Heliox. Low leak rates, accurate flowmeters and a minimum proportion of O2 to N2O permit closed circuit and low-flow anesthesia. Available with the 7800 ventilator, a microprocessor controlled ventilator with internal monitors. The Modulus SE also accepts the Ohmeda Respiratory Gas Monitor or the Ohmeda Rascal II. Hypnoxic mixtures: The Link 25 System keeps the O2 concentration higher than 25% (approximate value) at the common gas outlet for O2 and N2O mixtures. N2O and air or heliox flows stop if the O2 supply decreases to less than 20 psig (138 kPa). Agent mixtures: With correctly installed vaporizers, you cannot turn on more than one vaporizer at a time. The vaporizer manifold prevents gas flow through all vaporizers that are OFF. failure alarms, and alarms for low gas supply pressure. The Modulus SE has an alarm for O2 supply pressures less than 30 psig (207 kPa; approximate value). The ventilator to monitor inspiratory O2, expiratory volume, and airway pressure. The system switch to start gas flow and to turn ON the ventilator. A pneumatic alarm for low O2 supply pressure. A battery in the ventilator to continue ventilator operation during a power failure. An outlet box to supply electrical power to system components. A transformer in the box supplies power for the light. The ventilator to monitor inspiratory O2, expiratory and inspiratory volumes, and airway pressure. An electronic alarm on the ventilator for low O2 supply pressure. Software that adjusts for changes in fresh gas flow, breathing circuit compliance, and leaks. An outlet box to supply electrical power to system components. A transformer in the box supplies power to the light. The pressure mode supplies constant pressure during inspiration. The volume mode supplies constant flow during inspiration. Exhaled tidal and minute volumes. Peak, mean, and plateau airway pressures. High and low O2 concentration. High, low, sustained, and subatmospheric airway pressures. High and low minute volume (exhaled). High and low tidal volume (exhaled). The set breath was not supplied. O2/N2O mixtures in 25%-75% proportions at O2 flows as low as 200 mL/min. An absorber that uses less absorbent. Click the button below to add the GE Datex Ohmeda Modulus SE to your wish list.